Earshot Jazz is pleased to present one of today’s most celebrated jazz pianists and composers, Chano Domínguez, whose singular work is defined by his flamenco origins. Performing on June 4 at the Triple Door, Domínguez is joined by vocalist Blas Córdoba, flamenco dancer Daniel Navarro, bassist Alexis Cuadrado, and drummer Henry Cole. The distinctive performances and recordings of pianist Chano Domínguez result from his decades of exploration of the intersections of jazz and flamenco—an exploration that has culminated in acclaimed renditions with his quartet, Flamenco Sketches of the Latin-influenced compositions of Miles Davis. Born in Cádiz in 1960, Domínguez played flamenco guitar as a child before taking to the piano and, in his 20s, fronting the progressive Latin-rock band CAI. CAI released three albums before Domínguez went out alone in 1981 to push the most thrilling aspect of its output: its knitting of jazz and flamenco. He refined his approach for a decade in Europe, his reputation growing as he received such awards as first prize in 1986 in Spain’s National Jazz Young Talents Contest with his band Cadix, and as a 1990 finalist in the Martial Solal Piano Competition in Paris. After winning the 1992 Muestra de Jazz awarded by Spain’s Institute of Youth, he recorded his first album as a leader and composer, and in 1993, he moved to New York just as that album, Chano, appeared. Mergers of jazz and various forms of Latin music are hardly unusual; what sets Domínguez’s variant apart is his marriage of jazz and flamenco, the latter itself a result of the meeting of the musical and dance traditions of Western Europe and, from far to the east, Romani (gypsy) peoples. 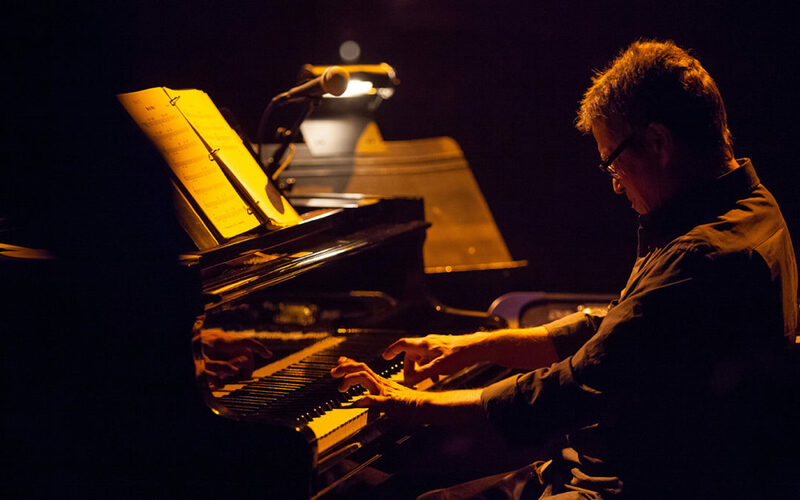 It has won Domínguez a variety of honors, including jazz publications’ best album for several of his discs, as well as four Grammy nominations: for best flamenco album of 2011 and 2015 for Iberico and Bendito, both on Blue Note, and for Calle 54 in 2001. During his career, Domínguez has performed and recorded with a who’s who of Latin jazz— Paco de Lucia, Paquito d’Rivera, Jerry Gonzalez, Chucho Valdez, Gonzalo Rubalcaba—as well as some of the greats of any sort of jazz—Joe Lovano, Herbie Hancock, Jack DeJohnette. Perhaps the highlight of his output, though, has been his Flamenco Sketches on Blue Note in 2012. Released to mark the fiftieth anniversary of the release of Miles Davis’ classic Kind of Blue, it presented his renditions of “Flamenco Sketches” and “So What,” and reached the top 40 of Billboard’s jazz albums chart. Domínguez deployed, there, the flamenco elements that make his recordings, and particularly his live performances, so thrilling: nods to the greatest Spanish composers, such as de Falla, Albeniz, and Granados, as well as traditional elements like clapping by a palmero, dancing and singing by a cantaor, and the use of flamenco percussion, particularly the cajón wood box. As will be apparent in his quartet performance here, the palmero, in particular, blends the quite different rhythmic traditions of flamenco, with its varyingly accented 12-beat cycles, and jazz. The result, for all Domínguez’s incorporation of such elements as Cuban son and jazz-fusion modes, “remains intensely Spanish,” Ben Ratliff wrote in the New York Times. Tickets are $22 adults, $20 Earshot members and senior citizens, $10 students and military and are available at thetripledoor.net.